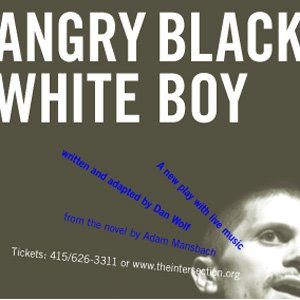 Dan Wolf wrote in with a reminder about an exciting event, his stage version of Adam Mansbach's novel, Angry Black White Boy (a primary source of inspiration for me that I wrote about awhile back, here). The play runs from tonight until November 16 at The Intersection for the Arts, in San Francisco. Being a man of the theater, Wolf immediately began thinking about adapting the book in some way, but he quickly learned the book had already been optioned as a movie. In his work with the Jewish Community Center, Wolf actually crossed paths with Mansbach, the two talked about some sort of stage adaptation, and Wolf was off and running. . . .
Part theatrical storytelling, part poetry, rap, beatboxing, ballet and hip-hop dance, “Angry Black White Boy” previews this weekend and opens Monday, Oct. 27 at Intersection and continues through Nov. 16. A must-see if you're in the area, and here's hoping this show goes on the road. If any readers of this blog manage to provoke my extreme jealousy by making it to Dan Wolf's Angry Black White Boy, please tell us what you thought of it in a comment. Here's a feature article about Dan and the new play from the San Francisco Chronicle. Ooh, very cool. I'll try to go if I can.